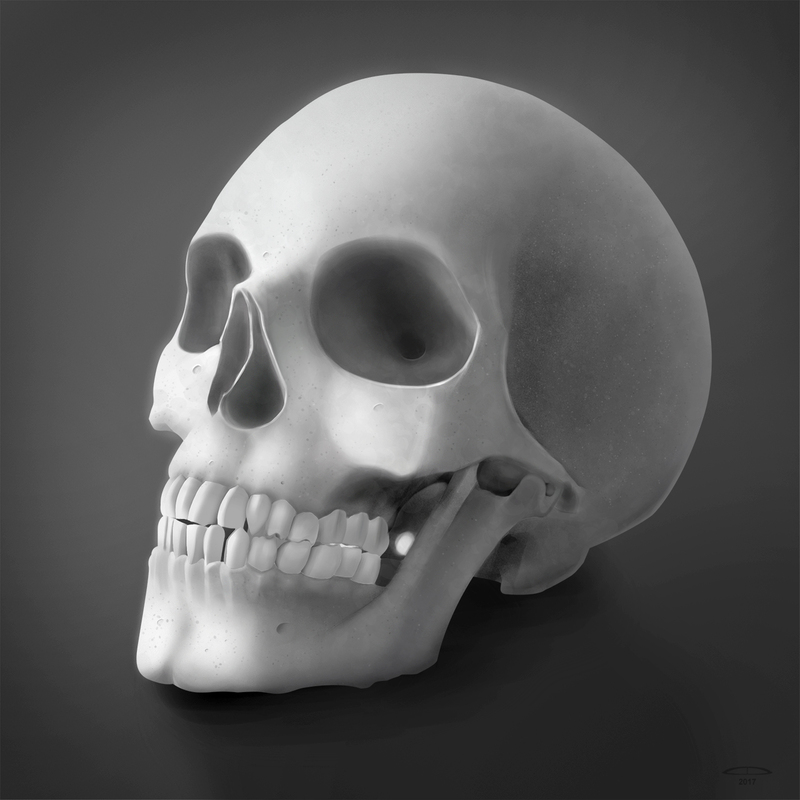 I’ve been sketching lots of skulls and working on anatomy lately, so I figured why not do a quick render of a skull to practice some values and texture? Of course, whenever I sit down to do something “quick” it is often anything but. Sketching things out went pretty fast, I spent maybe half an hour getting down the basic outlines and shading. Then I spent a little more time cleaning things up and started laying down my shadow shapes and establishing tone. I thought I was going to finish things pretty quickly, but I struggled for a while with the teeth and areas around the mouth. I probably was stuck for a few days on and off trying to get things looking right, and I just felt like I couldn’t no matter how hard I tried. I actually thought about scrapping the whole thing at one point and just doing something else, but I really wanted to get this stupid jaw down. Eventually after many run-throughs and putting things down for days to come back later I eventually moved on from the teeth and finished up refining the entire image. Now I could finally get on to the whole reason I wanted to paint a skull to begin with: the texture. I kept working in brush strokes and splatters until I got something I was happy with, polished it up and voilà. Overall I am content with the way things worked out, but I could use some more practice with teeth and the mouths in general.